Bristol City Council’s Urban Living Supplementary Planning Document (SPD) has now been adopted and provides a helpful indication of where development and significant change could happen to optimise density and create good urban living environments This is not limited to the city centre but includes, for example, areas characterised by low-density industrial and storage sheds. The heatmap makes assertions about the character of areas, their potential and the process one might go through to enact change. The desk-based study is a good start but warrants further thought and discussions on key areas and points in bringing forward regeneration opportunities. It places a broad call for significant developments, including those of multiple phases, large sites, transport changes or tall buildings(s) (those ten or more floors), to undertake a masterplan or area-wide framework, as the basis for outline planning applications. There is clear merit in encouraging an integrated approach for large projects but also questions over the extent to which outline planning applications can be insisted upon, especially where there are multiple landowners. The SPD does not offer an outline brief (say a housing target) for each area identified, though this may appear in the Local Plan Review. It stays silent on the resourcing implications of a holistic masterplan or framework such as technical studies, stakeholder involvement and public consultation. Some from other cities, where frameworks are not a generalised requirement, may note the pro-active role played by some local authorities. In such places frameworks (for very complex areas) are often covered by an authority policy document of their own, such as in many of London’s urban centres, or carried out as a joint venture between the council and developer partner(s), proactively bringing in public property, such as Manchester’s and FEC’s Northern Gateway, or the odd developer consortium where significant infrastructure investment is needed. A considered framework may be more appropriate than a full masterplan, in terms of process and design, for all parties. Nash Partnership’s experience on the ‘Southmead Regeneration – working for the community’ masterplan and the Bedminster Green Framework show early, continuous and balanced dialogue with Bristol on a pre-applications is important. It helps to form sound project aims, evolve ideas and ensures each proposal appropriately, and adequately, responds to the key and salient issues that differ across neighbourhoods, from Bristol’s centre to its suburbs. What is key – irrespective of whether a framework or masterplan can or will be prepared – is the importance of major proposals at significant density being urban design-led, to put the creation of streets and space for people centre stage. This then provides the context for subsequent architectural design and is the approach we routinely follow at Nash Partnership. 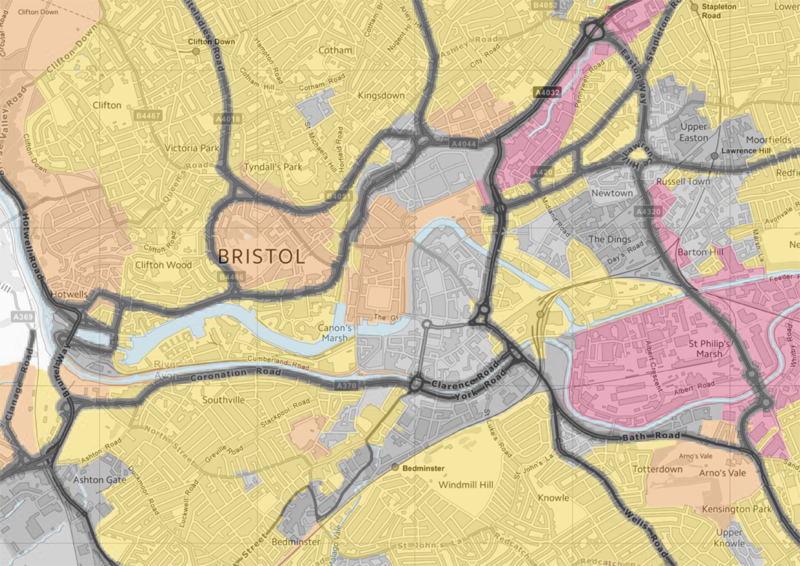 Image: Bristol City Council’s Urban Living Supplementary Planning Document (SPD) adopted Nov 2018, adapted figure 3, overlaid on OS map – showing areas most appropriate for change in red and grey.